Axel Foley hears about the shooting of Chief Bogomil, and heads for Beverly Hills to help detectives Taggart and Rosewood try to solve the "alphabet" robberies. 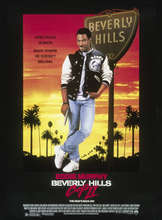 First sequel to Beverly Hills Cop (1984), very much following the original formula. Funny, but a shadow of what it should have been. Received an Oscar nomination for Best Original Song, "Shakedown."